This is a fantastic medal and one of the must haves for a medal collector. 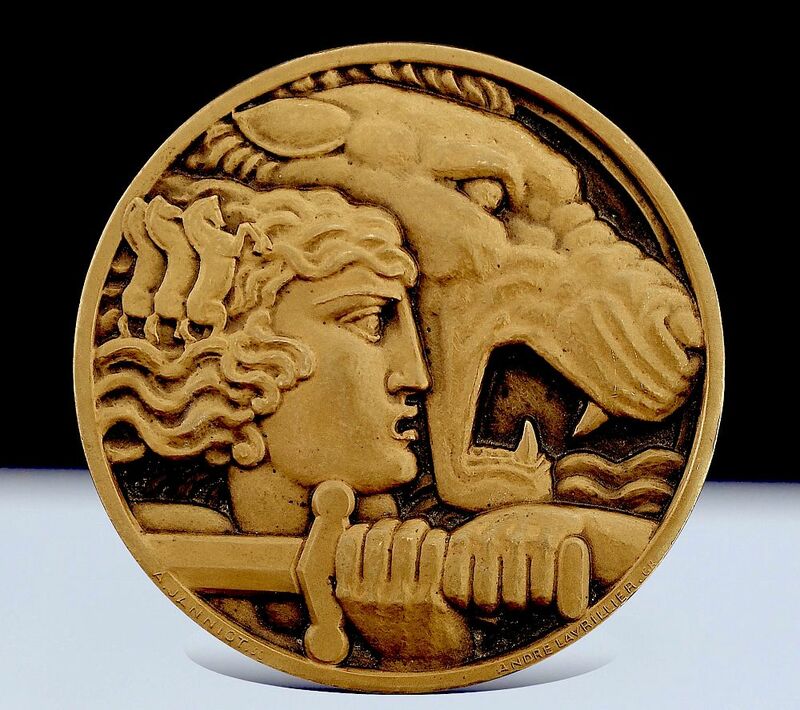 This medal was made to commemorate the Nice War Memorial - André Lavriller the medallist, was working from a design provided by Alfred-Auguste Janniot, the sculptor of the reliefs on the memorial. The obverse depicts a woman in profile looking forward with a sword clasped in both hands. In her flowing hair are 3 prancing horses. Behind her is a roaring lion. The edge of the rim is signed "A Janniot SC". The reverse is a depiction of the Nice War Memorial with "Aux Enfants de Nice Morts pour la France" in legend above. Beneath are the words "Roger Seassal arch, - A Janniot scull." 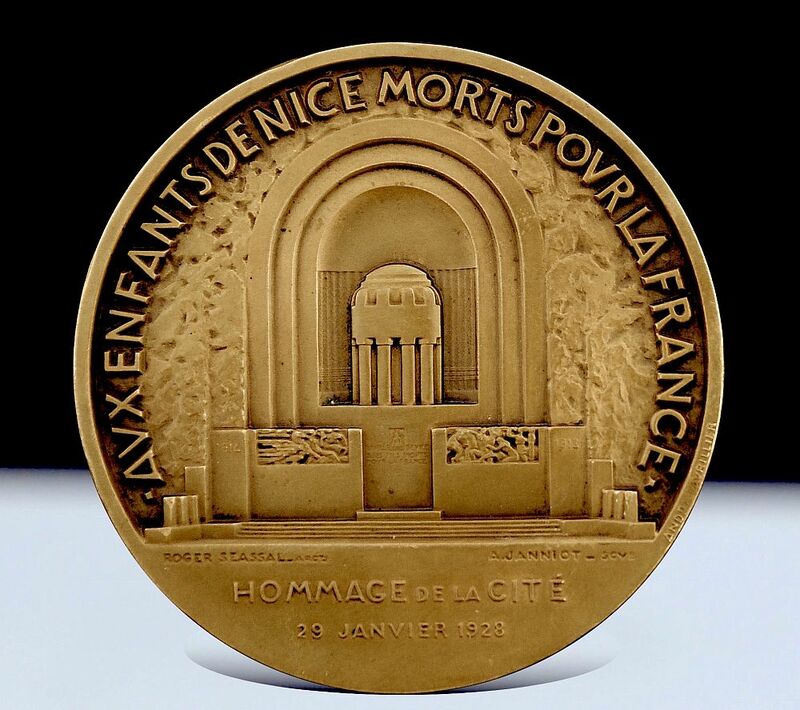 & "Hommage de la Citie 29 Janvier 1928". The edge of the run is signed "Andre Lavrillier".The rim is stamped "bronze" and has a triangular cartouche stamped with initials that appear to be "JB". French sculptor educated at the Ecole des Beaux-Arts. Pupil of Jean Antoine Injalbert. Won the 1919 Prix de Rome. Influenced by Antoine Bourdelle, most of his career was given over to Monumental & architectural sculpture. In 1938 he became a Legionnaire d’Honneur and from 1945-1959 he was Professor of Monumental Art at the Beaux-Arts Paris. His works include the bas-reliefs on the Palais de la Porte Doree, Paris (1931), the gilded panel on the façade of La Maison Francaise at the Rockerfeller centre (1930), the reliefs on the southern façade of the Palais de Tokyo (1937), the Nice War Memorial, the Fountain of the Sun, Nice and décor for the ocean liner the SS Normandie. Studied at the Upper National School of Fine Arts, Paris & in the workshops of Jule Chaplain, Frederic de Vernon & August Patey.